> Events in Maryland > Rooted, Winged. Kinetics Dance Theatre continues its 35thAnniversary Season with Rooted, Winged, at 8pm on Saturday, May 11that the Baltimore Museum of Art’s Meyerhoff Theatre. Ellicott City, MD–Rooted, Winged unveils a compelling collection of new work and returning repertory celebrating Kinetics’ long history in Maryland with the return of alumni dancers and choreographers. Through a rich program of professional modern dance, artists Betsy Romer, Ken Skrzesz, Rick Southerland, George Winchell, and Artistic Director Lauren Tait tell stories spanning connectedness and isolation, grief and beauty. Rick Southerland's Baroque Business bursts forth in an athletic and darkly riveting snapshot of the corporate world. Tait’s Chasm returns as well, taking a penetrating look at division both real and perceived. Founded in 1984 by Dorothy Fried, Keith Nichols, and Stephanie Simmons, Kinetics Dance Theatre embarked on a mission devoted to the development of contemporary dace as a vital art form within the community through performance, education, and outreach. Thirty-five years later, Kinetics is a vibrant body of artists, educators, learners, and patrons, with three parts work together to form a creative hub. Its professional company presents conceptually engaging concert work while also devoting a portion of its season to free and low-cost family programming in local theatres, schools, libraries, and community centers. 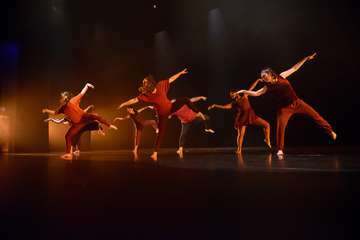 Its School of Dance emphasizes artistry alongside technique with a core program in modern dance paired with a technical ballet program. A breadth of offerings in many genres for children, teens and adults, as well for specific populations, bring dance to life for those of all ages and abilities. Four student performing companies provide dedicated young artists an opportunity for non-competitive in-depth study, exposure to workshops and guest artists, and a wealth of performance opportunities throughout the community.